Nice clean signlewide home with new carpet, paint, heat pump and central A/C, 3 bedroom 2 bath. 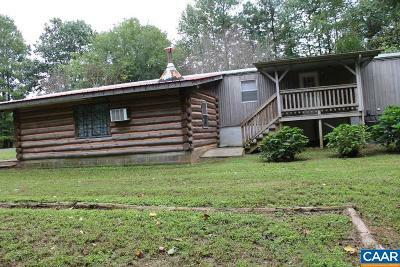 Nice 14' 5" x 23' 2" log cabin addition with a covered front porch. Large shop, 35 x 55, with a wood stove. Nice and private but close to Dillwyn for shopping and school. Easy drive to Richmond, Charlottesville or Farmville.